Rebekkah holds her Masters degree in Mind-Body-Medicine, from the college of Integrative Medicine at Saybrook University with concentrations in somatic counseling, nervous system regulation, and neurofeedback. She is certified as a Somatic Practitioner with the Somatic Experiencing Training Institute. She is certified in Neurofeedback by Saybrook University and via professional training with Stens Neurofeedback. Rebekkah’s accessible and empathetic disposition makes it easy to connect with her. Rebekkah listens, shares relevant information, and teaches valuable practices. Regulation and ease increase for Rebekkah’s clients. These shifts happen in real life, exactly as it is, exactly as you are. Rebekkah works with clients who are searching for relief. Some of her clients struggle with symptoms such as poor digestion, persistent headaches, and insomnia, while others are facing anxiety, depression, and difficult relationships, which Rebekkah helps them to navigate and mitigate. She also helps individuals recover from or lessen the effects of ADD, ADHD, and attention challenges. Via her graduate studies, she researched mind-body modalities from many traditions to discover which are the greatest change makers available to us today. She incorporates these evidence-based approaches into her sessions and classes. She works at the intersections of brain science, mindfulness practice, and somatic regulation. Rebekkah brings over 20 years of teaching experience and more than 15 years of client experience to her work. She shares mind-body wellness and somatic integration tools that truly change lives. 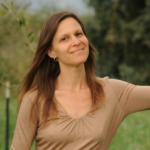 Rebekkah directed a thriving Yoga and Mindfulness Center from 1998 – 2008, taught at Spirit Rock Meditation center as their ongoing Family Program Teacher from 2010 – 2013, facilitated MBSR (mindfulness based stress reduction) courses from 2013 – 2016, then developed her groundbreaking protocol the Mind Body Reset in 2017. Currently she supports individual clients and groups with somatic counseling, neurofeedback, and brain chemistry balancing. Modern life can too easily throw us off, and we can find ourselves far from our natural balance and well-being. Rebekkah helps her clients to re-train their brain and nervous system thereby returning to their unique homeostatic balance.